The Project had taken its root while preparing for Inter-Hall Hardware Modelling Competition as part of General Championship 2015 IIT Kharagpur. The idea was brain child of Ayush Pandey and Subhomay Mahajan , who were the captains of the Team and well experienced with dealing with such projects. I was in my First year, as a part of electronics team and had recently learnt about autonomous robotics from college’s workshop in winters back then. Owing to its winning pitch, future scope of research and being one of its kind, all of the team members readily supported to let this idea as our future prospective. With sheer hard work, at last, we were able to complete the idea just before couple of hours before competition and later were able to achieve first position for the project. But this was not the end, as earlier stated, the idea was one of its kind with lot of research scope and hence we decided to continue the project with aid of our own funds to make it as much better as possible. This led us to publish our own research paper in IEEE Transportation and Electrification Conference (ITEC), first Position in KPIT Sparkle 2016 with reward of Rs 5,00,000 , and finally a Patent. Conventional methods of balancing a bicycle, which exhibits stability and behavior similar to that of an inverted pendulum, involves implementation of complex control systems and hence is difficult to achieve. It leads to increased complexity of the system as well as the cost. However, this research presented a method to attain the same with ease using a mechanically implemented control system which stabilizes the roll of the system. The research focused on the novel system design to achieve the stability mechanically and to convert the bicycle into a drive by wire system with proper modifications to the braking and driving. The uniqueness of the design is that the bicycle doesn’t lose its normal operation and can be operated in a dual locomotion mode. That is, according to need and circumstances, the cycle can be easily switched to either manual mode or autonomous mode. This includes releasing of steering clamp manually and switching on a power source, that’s it. The research also focused on various aspects of autonomous vehicles like, lane detection and navigation, obstacle avoidance and control system. The bike was able to localize itself crudely with help of GPS, avoid obstacle after appropriate detection with SONAR, maneuver with brushless hub motor and received commands through cellular network or wifi or internet as available.The proposed project could find wide end to end applications such as autonomous parking and retrieval of bicycle to the user’s location, sharing between multiple persons in urban bicycle sharing system. The proposed invention with its three-way hybrid nature( Manual, electric and autonomous) has the capability to revolutionize the current transportation system and simultaneously could be a boon to the differently-abled, helping them in their commute.The dual locomotion mode added to the low cost and less complexity of the autonomous bicycle make this a viable product. During my stay in project i.e from January 2015 to March 2016, I personally learnt various important aspects and debugging skills with which we actually need to deal in robotics. 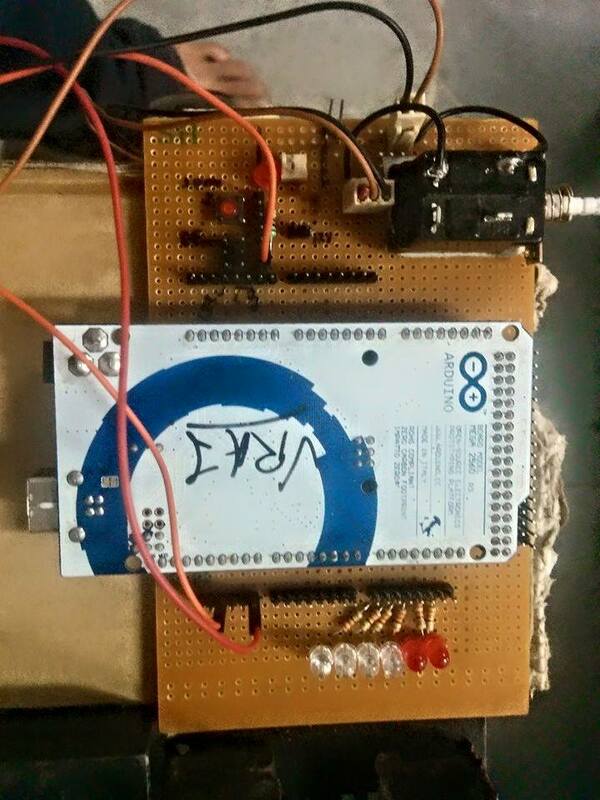 Though I was a part of electronics team, but I had never restricted myself to embedded work. I also extended my contribution in computer vision, that is with lane detection navigation and also wireless accessibility. During initial phase of project, I interfaced GPS to bicycle so that it could localize itself in environment and get the distance and heading to the destination. This involved event based coding as the nature of GPS sensor was to send those 5 strings of NEMA with frequency of 1 Hz. This delaying nature if dealt normally in line by line execution could have lead to slow responses form other sensors too and further failing to manuever as required. Hence, I resorted to event based coding which served the purpose. Further, my tasks included addition of wireless connectivity solutions like GSM, Bluetooth and wifi. Both GSM and Bluetooth module, I interfaced in a very similar way to GPS for event based nature. 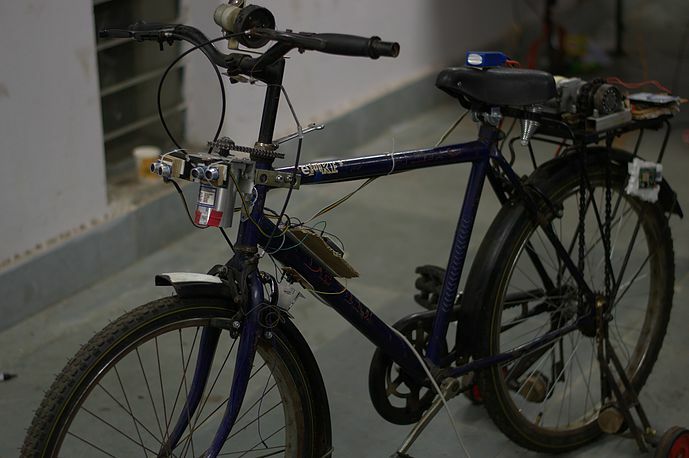 With addition of GSM module, I retained a long range connectivity to cycle owing to wide cellular network and also ease of operation with SMS. Bluetooth module served the purpose for Voice assistance to cycle which worked as planned with help of google’s voice recognition API. Further my task was to interface the wifi adapter with raspberry pi and code the script to access and dump important information over a web server. I simply resorted to urllib2 library available in python here. To top it all, I designed and soldered the circuits that were usually needed for clean power supply and connectivity between different modules. With advancing towards more capable prototype, I also got involved with lane detection and navigation. It was my second year back then, and I had learnt Image processing to a beginners level in summer. But this problem statement, lead me to actually get some more proficiency with Image processing owing to rigorous practice and OpenCV documentation reading and I was able to complete a code which can give appropriate target heading for cycle to turn when its within lane. I used couple of noise filtering commands like dilation, erosion, canny after thresholding them a thousand time 😛 within different light conditions though I had been using HSV. Later, I learnt about warp perspective transform and its capability to estimate distance in real world from camera view. It needed camera calibration using chessboard type mattress and if data is correctly fetched, the code gave me very similar result to bird’s eye view from top even when my camera used to point towards lane on surface. This is called Image perspective transform or in short IPT. Overall my code worked just fine, that is, it used to make cycle go oscillating within lanes but still restricted well within lanes. At present, I am still developing the code to give stable targets and also get better rid of background noise. Besides all this, I was always up for my teammate’s help like setting up PID control over steering of the cycle, setting up BLDC hub motor at rear for drive and also making technical reports. After all the project was success only with constant team effort and co-ordination which tops over individual work. Economics Times and many more. A must have app for arduino and android lovers! !